An antenna array is a group of radiators whose currents are of different amplitudes and phases. They use electromagnetic wave interference phenomena to enhance the radiative signal in the desired direction and diminish it in the non-desired direction. Antenna arrays are the solution to the problem defined as the limitations of operating a single antenna. A Yagi-Uda array, commonly known simply as a Yagi antenna, is a directional antenna consisting of a driven element (typically a dipole or folded dipole) and additional parasitic elements (usually a so-called directors and one or more reflector). The name stems from its inventors, as the Yagi-Uda array was invented in 1926 by Shintaro Uda of Tohoku Imperial University, Japan, with a lesser role played by his colleague Hidetsugu Yagi. 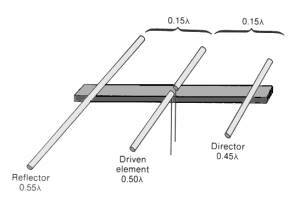 The reflector element is slightly longer (typically 5% longer) than the driven dipole, whereas the so-called directors are a little shorter. This design achieves a very substantial increase in the antenna's directionality and gain compared to a simple dipole. Highly directional antennas such as the Yagi-Uda are commonly referred to as "beam antennas" due to their high gain. However the Yagi-Uda design only achieves this high gain over a rather narrow bandwidth, making it more useful for various communications bands (including amateur radio). Procedure:A) To plot the radiation pattern of Yagi-Uda antenna in azimuth plane on polar plots. 4) Rotate the Yagi-Uda antenna of receiver end around its axis in steps of using stepper motor controller. 6) Connect RS232 from receiver to computer & transfer the reading by enabling serial mode at receiver. 1. Connect generator at 0 cm pointof slotted line . Set the frequency of source as 600 MHz. Hence free space wavelength lambda =20cm. Conclusion: The yagi-uda antenna was analyzed on the antenna trainer kit. Field Strength of various angle were obtained and radiation pattern were plotted for same. What are factors affecting yagi-uda antenna gain? What are factors affecting yagi-uda antenna beam width? What are factors affecting yagi-uda antenna impedance and return loss? Yagi antenna is generally used for which frequency range? What are the parameters to be considered for the design of a Yagi-uda antenna? Explain the special features of Yagi-uda antenna? What is the main advantage of Yagi-uda antenna? Draw the radiation pattern for Yagi-Uda antenna?